A Triceratops is another one of the most recognizable dinosaurs due to its three horns and it appeared in the late Cretaceous period around 68 million years ago in what is now known as North America. 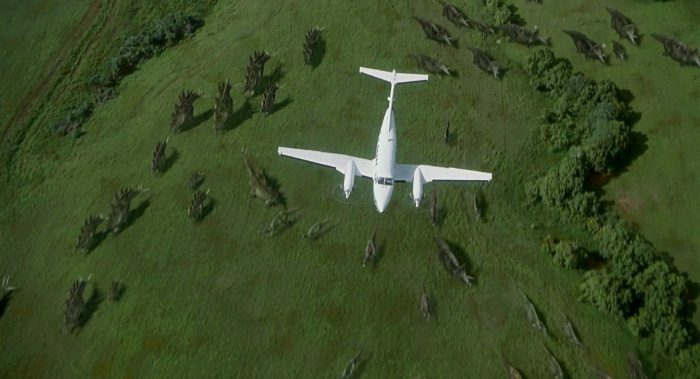 The Triceratops made appearances in all three Jurassic Park movies. Triceratops were about the same size of a modern day elephant but resembled a rhino and was a herbivore, feeding on low-level plants. It could reach up to 30ft in length, 10ft in height and weighed up to 12 tonnes. Its most distinguishing feature was its enormous skull which was among largest of all land dinosaurs. Its main features were its three horns and its frill. It was speculated that it used these in combat with the Tyrannosaurus Rex which roamed in the same areas. In the first Jurassic Park novel, it was said that a herd of 8 Triceratops live in “Triceratops Territory” where they have to be separated into smaller groups. Otherwise, they would sometimes kill each other for dominance. At the end of the novel, only 6 Triceratops remain but they are killing in the napalm bombing. In The Lost World novel, a herd of Triceratops can be found on Isla Sorna including one infant and they stay around the river. Later in the novel, they can be seen fighting a group of Velociraptors. The novel describes them as pale brown and have high-pitched barking sounds similar to dogs. 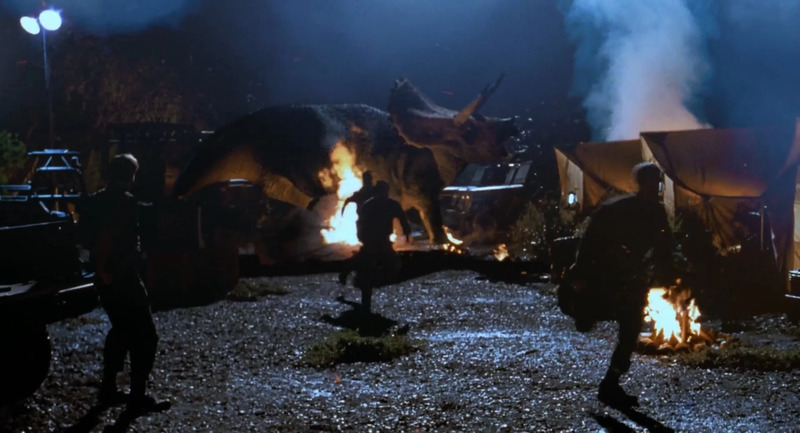 The Triceratops appears in the first Jurassic Park movie. 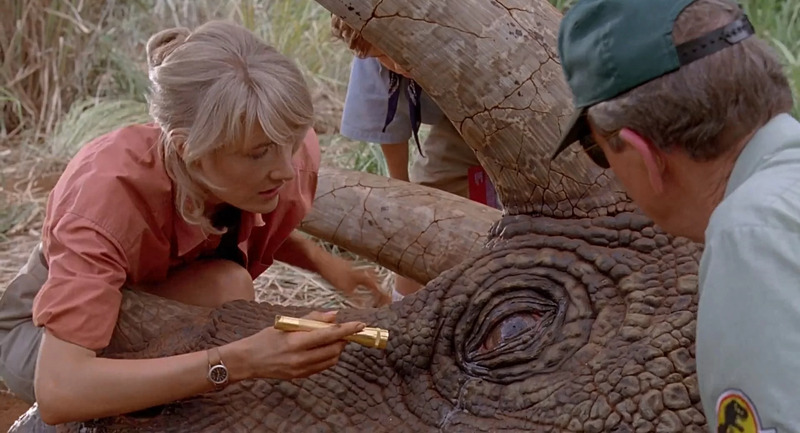 When the main characters were taking a tour of the park in the Explorers, they noticed Gerry Harding, the veterinarian, tending to a sick Triceratops. In a deleted scene, Ellie theorizes that the Triceratops got sick because it accidentally swallowed the toxic plant West Indian lilac thinking they were gizzard stones. An infant Triceratops was also supposed to appear in the film but was abandoned at the last minute. 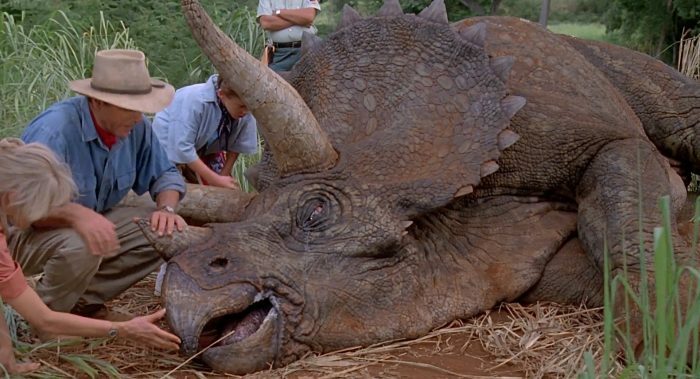 In The Lost World, a Triceratops and its infant were captured by the InGen team when they reached Isla Sorna. Sarah Harding and Nick Van Owen later frees all the dinosaurs and the Triceratops, in particular, does a lot of damage to the camp. In Jurassic Park 3, a herd of Triceratops can be seen when the plane flies over Isla Sorna. Triceratops are not real dinosaur!!! Mosasaurus has whale shark spots on this tall and back flipper(legs with out toes) larger than Megalodon so Right?? To triceratops can kill one T Rex and they’re very dangerous. how did you get the dinosaurs to work ? 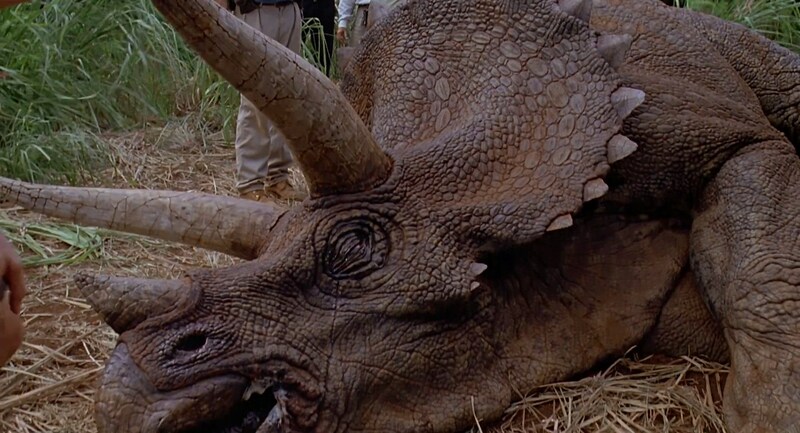 The Triceratops in the Jurassic Park film series was inaccurate because the adults have triangular epoccipitals on their frills but in real life, the triangular epoccipitals can only be founded on both young and juveniles but as the reached to the sub-adult and adults the frill epoccipitals get flatter making them less visible.